You know when you move house and stash a few items in the corner, and suddenly it’s eight months later and they still haven’t put themselves away? 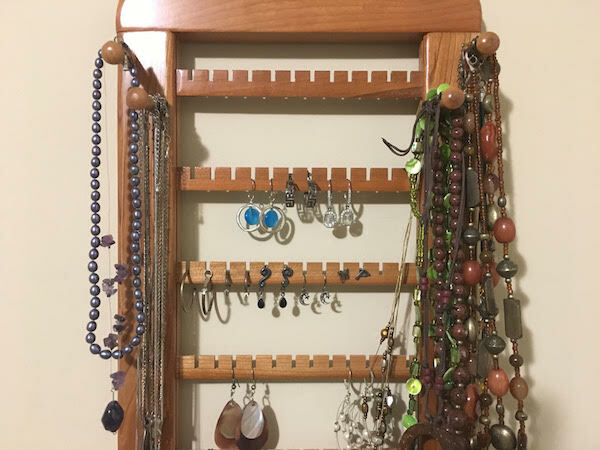 One of those items stored during our move last summer was my wooden jewelry rack. When I packed up the master bedroom in the old house, I put the rack in a large plastic bag, jewelry and all, and placed it flat on a high shelf in the master closet in the new house. I moved a few of my favorite necklaces and earrings into a bathroom drawer to wear until I could access the full selection. As I was getting dressed each morning, I’d look up at the jewelry rack in the closet and think, “If you just make time to hang this, you’ll have less clutter and more jewelry to wear.” But the weekends would pass, and still it wouldn’t get done. Darren and I needed to buy a stud finder and batteries, and find some drywall anchors and the level and a sharp pencil. It all seemed like too much. Last Saturday I told Darren, “If we do one thing this weekend, let’s hang my jewelry rack.” So with that laser focus, and with the kids playing together on the floor of our closet, we gathered up all of the items we needed and hung the rack. Seeing it hanging on the wall, at long last, felt like a huge victory. But as it turns out, there was a Part 2 of the Jewelry Rack Challenge. My strategy to move the jewelry without it tangling didn’t work, and two dozen necklaces and various earrings had become twisted into an ugly mess. I set it on the floor and took stock of it. It looked tangled beyond resolution. Maybe I should just put it back on the shelf and deal with it another day, I thought. It just seemed like too much to handle, when the kids were starting to go wild. But I knew that I would probably put it off for another six months. Instead, I sat down on the floor and gently pulled the end of one strand, a thin, silver chain. Evan wanted to help, so I asked him to help me look for the path of the necklace. Over, under, and through, we freed the chain, hung it on the rack, and high-fived each other. Then we tackled a second. When one snagged too much, I resisted the temptation to use brute force that would further tangle the jewelry. Instead, we changed our focus to another necklace that was easier to extract. One by one, we untangled them, unhurried but determined to reach our goal. Twenty minutes later, the pile on the floor had disappeared, and the necklaces and earrings hung in neat rows on the jewelry rack. I almost couldn’t believe that we had overcome such a daunting task so quickly. It felt almost magical that suddenly there were no more knots to speak of. We had untangled all of them, one thread at a time. I love The Bachelor, and I’m not ashamed to say it. The collective outrage this week over Arie’s take-backsies proposal to Becca and for-realsies proposal to Lauren, then the nationwide cheer when Becca was announced as Bachelorette, was riveting. The routine of watching The Bachelor and Bachelor-related shows, then dishing with my friends, consuming tweets, the feminist Here to Make Friends Podcast, and Ali Barthwell’s delightful Vulture recaps is one of the few things I do for pure enjoyment and not self-improvement. The Parkland teens. ‘Nuff said. This is from last spring, but a friend recently shared it and had me LOL’ing: Newport, Oregon police investigated what appeared to be a cat perched in a tree, holding an assault rifle.